Halloween is one of my favorite times of the year. I can remember trick-or-treating around my neighborhood when I was younger, crunching leaves as I walked. Halloween signals that winter (and therefore, snow) is coming on the East Coast and it gets me excited. Now, it could be that I was really just excited for snow days at school, but that feeling has stayed with me throughout my adult years. Since I am the one giving candy instead of receiving it (man, getting older is a sham, huh? ), I wanted to find the best candies out there while staying true to my values. 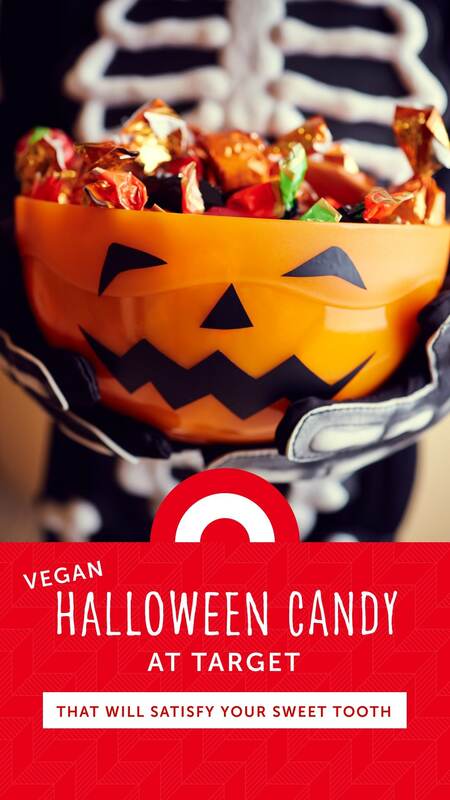 As an ethical vegan, I was looking for animal-friendly Halloween candies, and I knew I wouldn’t be the only one. So I ran into Target with my Mercy For Animals sweatshirt and got to reading all the ingredients on packages of candy so you don’t have to. First and foremost, Smarties are a sweet and slightly sour old-school candy. You can always rely on Smarties to make a kid’s day. And company co-president Liz Dee is the badass founder of Vegan Ladyboss! While not my personal favorite, they are my brother’s! And during the Halloween season, they have the cool skulls-and-bones version. This is literally the only time it’s cool to eat skulls. Another classic! You really can’t go wrong with those little boxes of Nerds. They are almost as fun to shake as they are to eat. OK, so this one even made me stop dead in the aisle. These naturally flavored snacks include cherry, lemon, orange, and strawberry. They’re also nut-free, soy-free, sulfite-free, sesame-free, and organic. So if you have a school Halloween party, these are the ones to bring! If you don’t know that Skittles are vegan, I’d swear you’ve been living under a rock. Taste the rainbow, for sure. Another organic treat! And who doesn’t like lollipops? Not only will these vegan goodies make trick-or-treaters happy; the company gives support to improving education in schools. One bag contains 30 lollipops! Yet another classic! You seriously can’t go wrong with these. Normally, I’d leave this one out because it’s not a candy. But the chips are shaped into these cute little ghosts. I’ve never seen other chip brands do this, so the product gets points in my book. Two words: vegan gummies. Unlike their animal-based counterparts, Yum Earth’s gummies are gelatin-free. Another plus: They’re organic. These three come in a handy mixed bag, so you can have variety and your trick-or-treaters can choose what they want. And if they don’t want them, it’s their loss, your gain. This OREO cookie goes out to our 3,118,033 #zombies who can smell the Halloween treats from 6 feet under 🎃. OK, so this one really isn’t for trick-or-treaters, but who can resist the orange cream filling and delicious cookies with spooky designs on them? Nobody really. You’re welcome. Looking for more ways to be creative this Halloween season? Check out some of our favorite spooky recipes! *Note to readers: Always check the ingredients before purchasing items as they may vary from location to location.